With Google claiming less than 2% of the market in China, the search engine landscape is markedly different from that in most Western markets. While there are several key players, including Haosou, Sogou, and Shenma, in the space, Baidu is undoubtedly the first port of call for most companies looking to run search marketing campaigns in China. This guide will give you a better understanding of China’s biggest online marketing channels and how they operate. There are several reasons why advertisers turn to Baidu when looking to advertise their products or services to Chinese consumers, the most important of which are outlined here. Most significant is the fact that Baidu has the highest market share across both desktop and mobile. According to Statcounter, Baidu boasts 59% of the Chinese desktop search market, with Haosou coming in in second place, with 26%. On mobile, Baidu’s dominance is even more obvious as it has a 78% market share. As a platform, Baidu offers advertisers more options than just paid search, with in-feed ads and display ads being two other popular advertising options on Baidu. Having been set up in the year 2000, Baidu boasts a relatively mature structure compared to other search engines, together with better customer support and more open resources. Following a scandal in 2016, Baidu has been forced to overhaul its search results ranking system. There is now a maximum of four paid adverts shown at the top of desktop search results on Baidu, rather than the previously allowed 11. These are followed by organic results and a maximum of two paid results at the bottom of the first page of results. As shown in the screenshot below, related products or brands are also shown on the right-hand side of the results. On mobile and tablet, Baidu search results display a maximum of three paid adverts at the top of the page, followed by organic result, and more adverts. The exact layout of results on Baidu changes from time to time, so it’s important to keep up-to-date with the latest developments. Before diving into PPC advertising on Baidu, it’s worth taking a look at typical search behaviour in China. When a search is driven by purchase intent, the vast majority of Chinese consumers would turn to an e-commerce platform such as Tmall, Taobao, or JD.com rather than searching on Baidu. 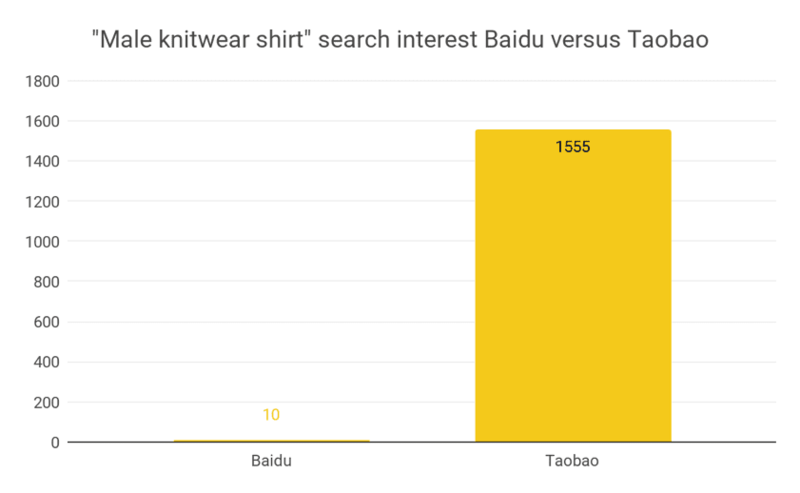 This is demonstrated in the example below, which shows daily search volume for the same term - ‘male knitwear shirt’ - on Baidu and Taobao (data from Baidu keyword planner and Taobao keyword planner, respectively). However, if Chinese consumers are at an earlier stage of their purchase journey, they are more likely to search on Baidu for product reviews, style guides and other information, to help inform their purchase decision. Before you actually start investing in advertising on Baidu, it’s vital to have a good idea of the volume of impressions you are likely to receive on the platform. Baidu’s own Keyword Planner is a great starting point for estimating the number of impressions you can expect for certain phrases, allowing you insight into daily impressions, estimated cost-per-click and the level of competition for your space. If your brand awareness levels are currently very low in China, or if the sector in which you operate is very niche, it may be better to start with upper-funnel advertising, such as paid social and display, rather than diving straight into paid search on Baidu. Setting up a Baidu advertiser account is a much more complex process than the equivalent on Google Ads. There are essentially two options for doing so - to be set up directly with major Baidu branches such as Beijing and Shanghai, or through a Baidu-listed agency partner. Due to the complex, ever-changing process involved, many companies choose to work with a specialist digital agency when getting set up on Baidu. Industries that are particularly highly regulated include the health sector (especially health supplements), finance, and gambling - which is completely forbidden. In many ways, getting the basics right on Baidu is much the same as on other search platforms. Having a clear account structure, for example, is vital, as is ensuring you have a good combination and split of match type, allowing you to filter the most valuable traffic. 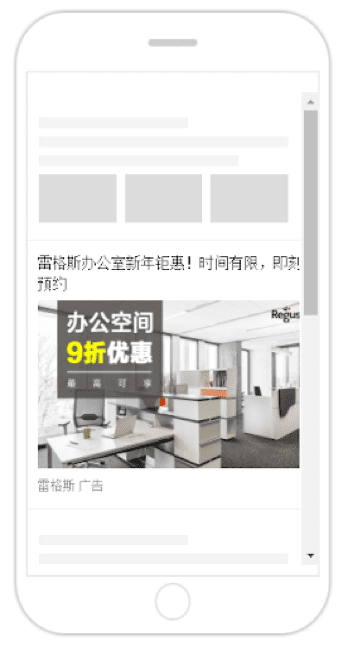 When advertising on Baidu, localizing your ad copy is vital for success. Rather than simply translating your ad copy, ensure you use on-the-ground experts who are able to tailor your ads to the local market and trends. Making sure you have clear tracking in place for Baidu is also vital. Using Baidu’s analytics is a great option, given its direct integration with the Baidu interface. However, using your existing global reporting system, such as Google Analytics, is also possible - just be aware that there can be data discrepancies. Protecting your brand and any trademarked product terms on Baidu is even more important than on other search engines, as Chinese consumers place a high value on brand recognition, generally preferring to purchase from those brands they know and trust. Potential scenarios on Baidu may include competitors bidding on your brand term; using your brand term in their ad copy or using exactly the same ad copy as you. Some competitors may even go so far as to procure false clicks on your ads in order to quickly exhaust your budget. Fortunately, Baidu offers various levels of (paid-for) brand protection, with the highest level meaning that competitors aren’t even able to bid on your brand keywords. If your brand already has some recognition in China, it’s worth considering Baidu’s brand search products in order to own the SERPs for your brand and trademark terms. The ads, triggered by keywords, are interactive and media-rich, allowing brands to occupy the top position of their brand terms at all times. The product can be customized to each brand, with an example for Gucci shown below. This allows advertisers to target their competitors’ audience (based on previous searches, visits etc.) in search ads. This feature allows you to not only target the most relevant audiences and avoid entering bidding wars with your competitors but also to build brand awareness whilst reducing cost-per-click and achieving incremental conversions. As well as all of the features outlined above, Baidu is constantly evolving, offering new and exciting opportunities for advertisers. Baidu Baike is another Baidu product worth having on your radar. The equivalent to Wikipedia in China, Baike boasts up to 14,880,000 daily active users and is afforded high priority in organic results on Baidu. It’s clear that Baidu presents a huge opportunity for advertisers looking to tap into the Chinese market. Whilst Chinese consumers looking to buy will usually go to an e-commerce site first, they often still search for reviews, advice and other information on Baidu. 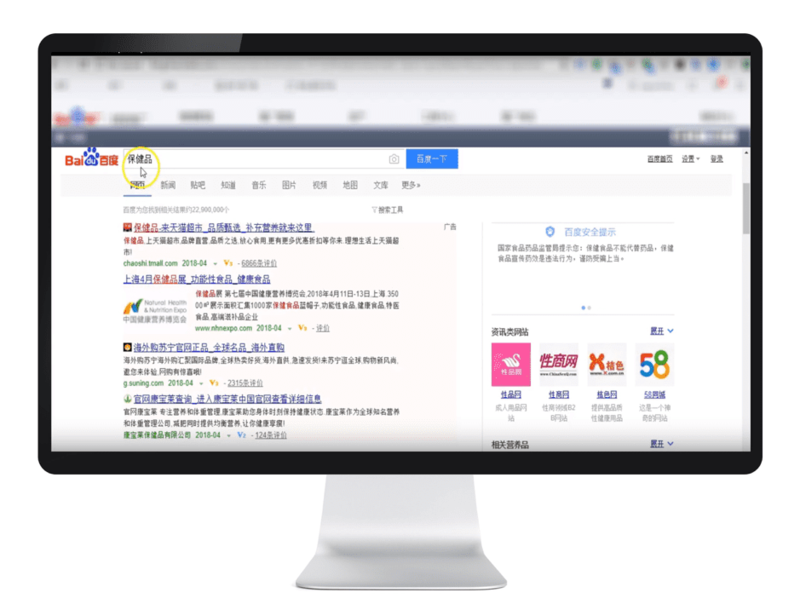 Before investing in PPC on Baidu, it’s vital to evaluate traffic volumes, as well as being aware of China’s advertising policy and industry-specific rules. In addition, you should be prepared for higher levels of competitive bidding activity than you may be used to on other platforms. By localizing your ads and keywords, rather than simply translating them, as well as making the most of the latest ad extensions and other features available, you will set yourself up for the best chances of success on Baidu. Ada Luo is an account director at Croud and has worked across international clients including Cambridge Satchel Company, Regus, Michael Page, and Netflix. Ada specializes in Baidu across paid search, display, and native ads, leading Croud's Baidu practice and wider China team. Need help with your Internet advertising? US, Europe and Worldwide display ad clickthrough rates statistics summary I’ve put this compilation together to help marketers and students studying interactive marketing create direct response conversion models for digital marketing campaigns. When I originally compiled these stats from different …..
Everything you need to know to maximize the revenue of your digital inventory It used to be that advertising meant newspaper ads and flyers. In today’s digital world, advertising has reached new levels. Advertising has evolved into a global marketplace …..